Leaving his life of petty crime and drug abuse behind, young Douglas flees from Minneapolis to Edinburgh, Scotland, to his stern but fairminded Grandma McLaren, who will take him in if he can support himself. Fortunately, few cities are friendlier than Edinburgh to a guitarist with a talent for spontaneous rhyme, and soon Douglas is making a decent living as the busker who can write a song about you on the spot. But Edinburgh has its dangers for the unwary. The annual arts festival, biggest in Europe, draws all manner of footloose sorts, and when a mysterious but alluring young girl offers him drugs, Douglas's resolve fails him. What follows isn't what he expects. Suddenly, Douglas can see, in all their beauty and terrifying cruelty, the fey folk who invisibly share Edinburgh's ancient streets. Worse, they can see him, and they're determined to draw him into their own internecine wars--wars that are fought to the death. 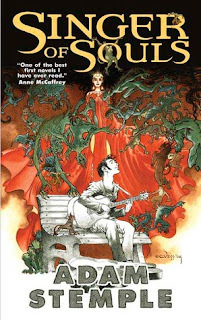 Singer of Souls is a very dark fantasy about a young musician and recovering heroin addict who leaves Minneapolis to start a new life with his grandmother in Edinburgh, Scotland. Douglas draws in the crowds by using his guitar and voice to compose personalized songs about passers-by. While living with his grandmother and making a decent living, he manages to stay clean until he meets an unusual woman who presents him with a white powder that steers him off the path to recovery. Instead of achieving the desired high, Douglas' life takes an unpredictable turn when the powder gives him the ability to see Edinburgh's invisible fey inhabitants. I gobbled up this short, fast-paced, magical and very dark fantasy in two sittings. I loved the characters, the setting and the ability of the music to enchant and transform its listeners. The faeries and other magical creatures are not beautiful or enchanting. This is a dark and gritty urban fantasy with a horrifying ending that makes me want to drop everything and grab the sequel.